Old Dominion University will receive grants totaling nearly $1.3 million from a new Virginia economic development initiative for two workforce programs. The grants come from Virginia Growth and Opportunity (GO Virginia), which aims to boost private-sector growth and job creation in regions throughout the commonwealth. In its first round of funding, the 24-member GO Virginia board approved grants for five projects, including two at ODU. The university will receive $647,540 for a digital shipbuilding workforce training program and $642,713 toward the Hampton Roads Cybersecurity Education, Workforce and Economic Development Alliance (HRCyber). ODU’s projects, which are expected to be up and running by March, aim to create about 2,000 jobs within five years. The grants will “allow us to collaborate within the industry and create jobs that are geared towards the digital enterprise,” says Eric Weisel, executive director for ODU’s Virginia Modeling, Analysis and Simulation Center (VMASC), which is handling the projects. The shipbuilding and workforce program will work with companies to create an industry board, promote workforce development and develop a curriculum for training a digital labor force of about 8,500 people. Other funds not tied to GO Virginia already have been earmarked to create a digital shipbuilding lab at VMASC’s facility in Suffolk. HRCyber meanwhile is a pre-existing partnership aimed at educating Hampton Roads’ cybersecurity workforce. Last year, then-Gov. Terry McAuliffe identified 36,000 unfilled cyber jobs in the commonwealth. HRCyber is working to address that skills gap. 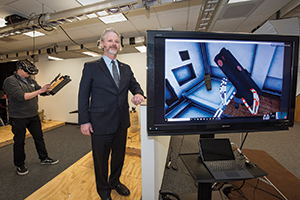 During the past few years, federal grants and in-kind matching funds have been used to expand an existing VMASC facility, the HRCyber Collaboration Laboratory. It promotes regional innovation in the fields of cybersecurity, data analytics, virtual technologies and autonomous vehicles. The $642,713 GO Virginia grant will be used for workforce development and innovation programs administered through the lab. The project is expected to help create digital jobs through internships and incentives with startups and other businesses, while crafting a “Cyber Arena,” a virtual environment to test new technologies within the network.